Please be sure to read the information and instructions below before you register. We look forward to working with you! Prior to registering, we encourage you to verify that your computer is compatible with our learning management system by clicking here. 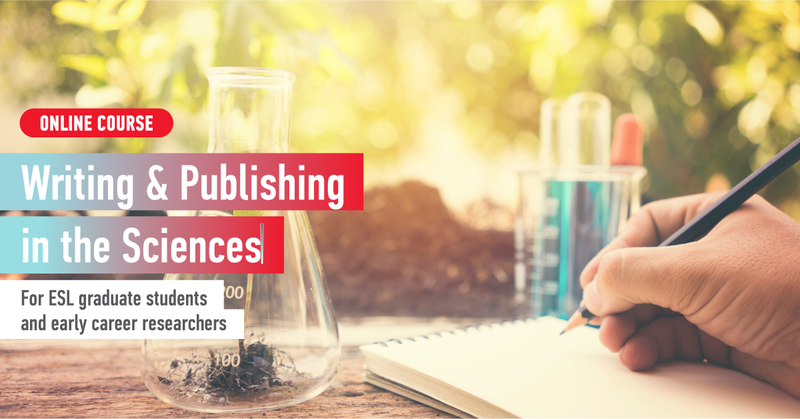 Scientific Writing and Publishing: Graduate ESL is intended for graduate students, postdoctoral fellows, and early career researchers in the sciences whose first language is not English or who have limited experience writing in English for publication purposes. 2. How might I benefit from taking this course? Because English is the primary language of publication worldwide, and particularly in the sciences, the ability to write effectively in English can result in wider dissemination of your research findings and improved career prospects, both in academia and in industry. 3. Is this a credit course? Scientific Writing and Publishing: Graduate ESL is a non-credit course. Upon completion of the course, you will receive 4 Continuing Education Units (CEUs). Check with your home institution to determine whether these units might be recognized as co-curricular and/or professional development units. 4. How is the course structured? communicate with the tutor and/or other students (online meetings, email). 5. Is the schedule flexible? Yes, but you must follow the course calendar and submit your work on the dates specified. 6. How many hours of work are required each week? It is expected that you will devote 4 to 5 hours per week reviewing course materials, completing writing assignments and grammar, vocabulary, and style exercises, and contributing to discussions on online forums. 7. How will I be evaluated? Evaluation is based on your individual written work and your participation in various learning activities. 1. Do I have to take a placement test before registering? 2. Can I CANCEL MY REGISTRATION before the course starts? Yes. To avoid any financial charges, you must cancel your registration before 5:00 p.m. on May 26th, 2019. The tuition fee will be fully refunded, and the course will not appear on your Record of Study. 3. Can I REGISTER for the course once it has started? Yes, but you must register before midnight on June 2nd, 2019. Please click here to register. 4. Can I DROP the course once it has started? If you wish to drop the course once it has started, you must do so before 5:00 p.m. on May 30th, 2019. The tuition fee will be refunded, minus a $20.00 administration charge, and the course will be deleted from your Record of Study. If you do not drop the course before 5:00 p.m. on May 30th, 2019, the tuition fee cannot be refunded. If you missed the course-drop deadline and you intend to withdraw from the course, you must do so before 5:00 p.m. on June 3rd, 2019. For fuller details, please review the course-withdrawal policy set out in number 5 below. 5. Can I WITHDRAW from the course once it has started? The official course-withdrawal period starts at 5:00 p.m. on May 30th, 2019 and ends at 5:00 p.m. on June 3rd, 2019. No refund will be issued, and a grade of "W" will appear on your Record of Study. As of 5:01 p.m. on June 3rd, 2019, it is not possible to officially withdraw from the course. If you decide not to finish the course, the grade indicated on your Record of Study will be based on the work you completed. 1. What is the role of the Online Tutor? motivating and encouraging students to learn and succeed. 2. How do I get in touch with the Online Tutor? Your tutor can be reached by email, on discussion forums, and during online meetings in real time. Microsoft Office Word or compatible. 2. Is my computer compatible? Prior to registering for the course, we encourage you to verify that your computer is compatible with our learning management system by clicking here. E. Whom Do I Contact? Client Services personnel are available on-site Monday through Thursday, from 9:00 a.m. to 6:15 p.m., and Fridays from 9:00 a.m. to 5:00 p.m. They are located on the 11th floor of 688 Sherbrooke Street West, Montreal (corner of University Street). For additional information, please visit their website. The McGill Writing Centre's main office is open Monday through Friday from 9:30 a.m. to 12:30 p.m. and from 2:00 p.m. to 5:00 p.m. We are located in the McLennan-Redpath Library, Main Floor, Room #02. The street address is 3459 McTavish Street, Montreal (corner of Sherbrooke Street West). If you wish to meet with one of our academic staff, please request an appointment through mwc [at] mcgill.ca. If you simply drop by, we cannot guarantee that anyone will be available to meet with you. You can also send an email to techsupport.scs [at] mcgill.ca.